COME REGISTRARSI E POSTARE MESSAGGI. LA REGISTRAZIONE TI PERMETTE DI POTER PARTECIPARE E PUBBLICARE LE TUE FOTO, I TUOI MESSAGGI O RISPONDERE AI POST DEGLI ALTRI AMICI UTENTI. ENTRI A FAR PARTE DELLA COMUNITY. PASSO 1. NECESSARIO PER LA REGISTRAZIONE. 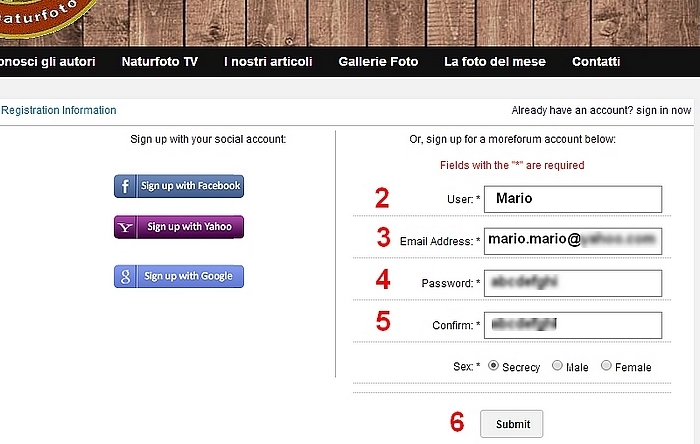 INSERISCI I DATI RICHIESTI: USERNAME, EMAIL, PASSWORD E CLICCA SUL TASTO "SUBMIT", COME INDICATO DALLA SEQUENZA NUMERICA IN FIGURA. DETTO QUESTO, ORA CLICCA SULL'ETICHETTA FORUM INDICATA IN FIGURA DALLA FRECCIA ROSSA E ACCEDI ALLE VARIE SEZIONI DEL FORUM. IN OGNI SEZIONE TROVERAI I MESSAGGI DEGLI UTENTI E POTRAI INSERIRE ANCHE I TUOI O RISPONDERE AGLI ALTRI . CLICCA IL TASTO "NEW TOPIC" (NUOVO MESSAGGIO). SI APRE LA PAGINA DI COMPOSIZIONE DEL MESSAGGIO. INSERISCI NEL CAMPO "Title" IL TITOLO DEL MESSAGGIO. SCRIVI IL TESTO NELLO SPAZIO SOTTOSTANTE E E UTILIZZA LE ICONE DEGLI APPOSITI STRUMENTI PER PUBBLICARE LE TUE FOTO O GLI ALTRI CONTENUTI. PER RISPONDERE AI MESSAGGI CLICCA IL TASTO "POST REPLY" (PUBBLICA LA RISPOSTA). 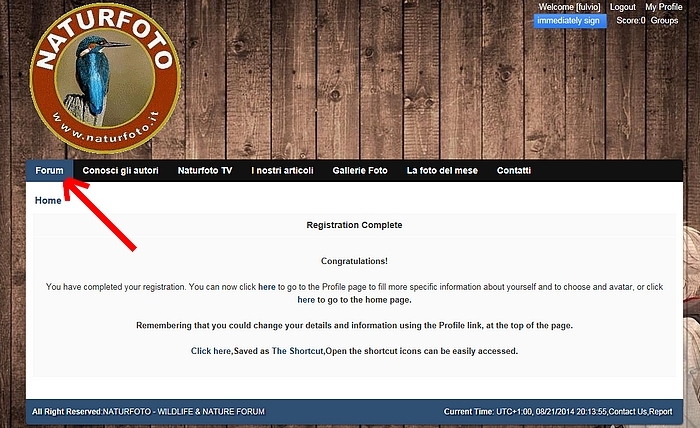 IN ALTO A DESTRA DELLA PAGINA DI NATURFOTO FORUM CLICCARE SULLA SCRITTA "Logout"
OAR CHE SEI REGISTRATO, PER I FUTURI ACCESSI TI BASTA CLICCARE IL TASTO " SIGN IN " (OVVERO "ACCEDI" PER GLI UTENTI GIA' REGISTRATI), CHE SI TROVA NELL'ANGOLO IN ALTO A DESTRA NELLA PAGINA DI NATURFOTO FORUM. DA QUESTO MOMENTO PER L'ACCESSO VERRANNO RICHIESTI SOLO LO USER E LA PASSWORD. SE INCONTRI DIFFICOLTA' CONTATTACI AL SEGUENTE INDIRIZZO EMAIL.